While I’ve been on maternity leave, mostly I’ve been soaking up time with Taylor, but I’ve also managed to squeeze in a few craft projects. 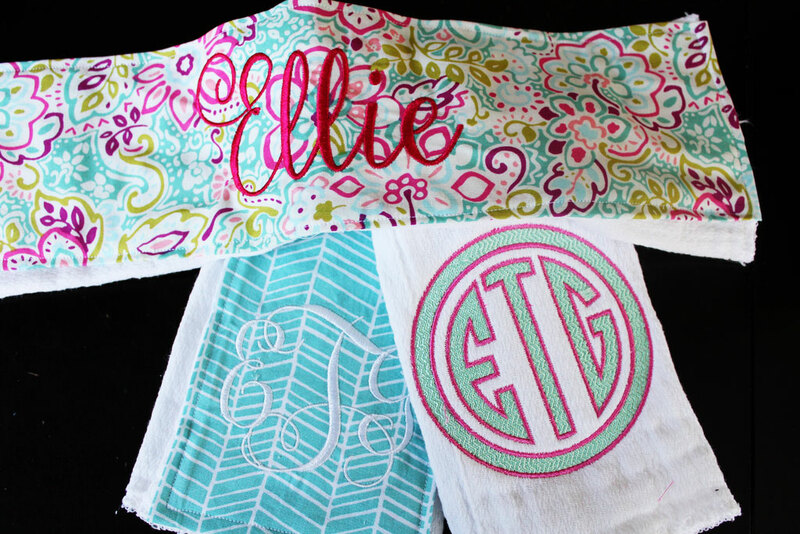 I shared the burp cloths I made for Miss Taylor, but I also made a set for my good friend Lauren’s little girl Ellie… and even embroidered them with her name/monogram (Because who doesn’t love a good monogram)! And because I was having so much fun I texted another good friend with a daughter around the same age to ask what her favorite animal was, her answer (as every awesomely imaginative 2 year old is…) was a moose cow. 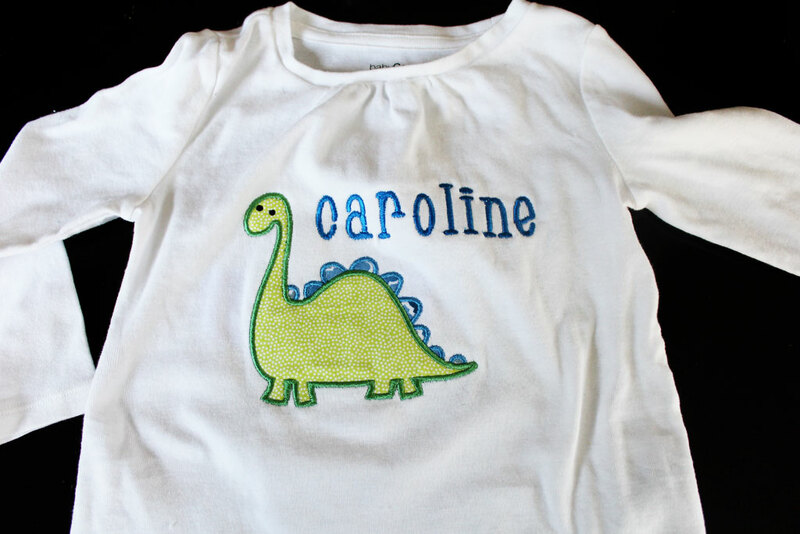 Well, I couldn’t find any of those on Etsy, but since her mom told me she also loves dinosaurs, I found a super cute brontosaurus to applique for her! (That one is from Applique Cafe Designs on Etsy). 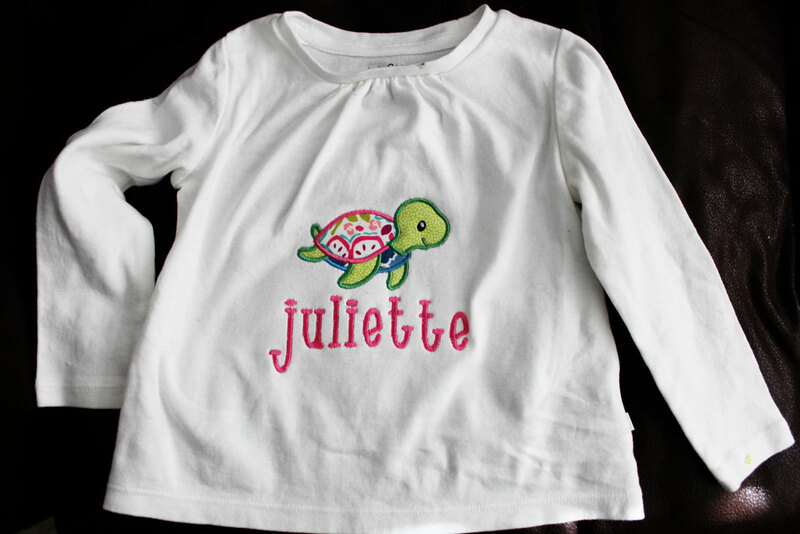 My niece also loves Myrtle the Turtle, so I decided she needed a Sea Turtle on her shirt! 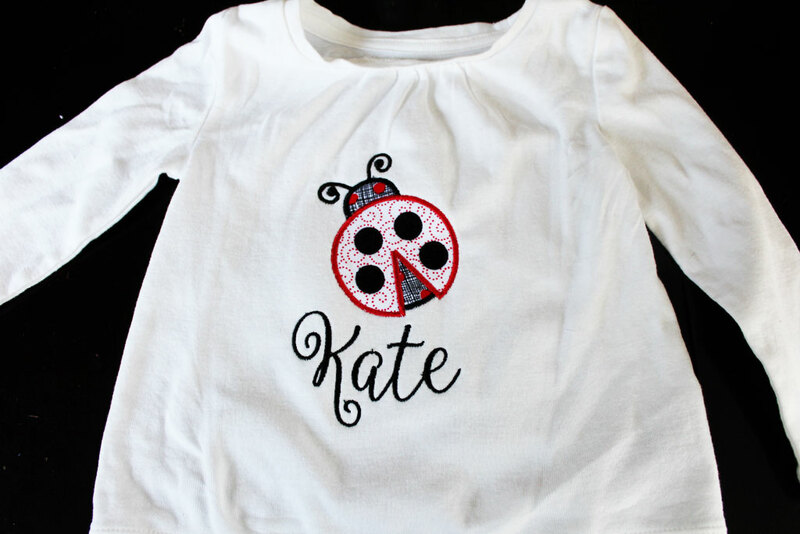 This SUPER cute design is also from Rivermill Embroidery and you can find it here. For the shirts, I bought long sleeve playtime favorite tees from Gap Kids when I had a 40% off coupon. The shirts are a great thickness and when they are 40% they are pretty affordable. And the great thing about applique is that it is a great use for small pieces of fabric! I got a great video of Juliette opening her present saying… Myrtle Turtle! Right there!! I love being able to make things for friends and it makes me sort of ridiculously excited to have a project come out this cute!! That feeling? When I see a project come out like it looks in my head? That is why I love to craft and make things! Caroline loves her dinosaur SO much!